In this interview we talk to the former finance minister of Greece, Yanis Varoufakis, and philosopher, activist and author, Srecko Horvat. 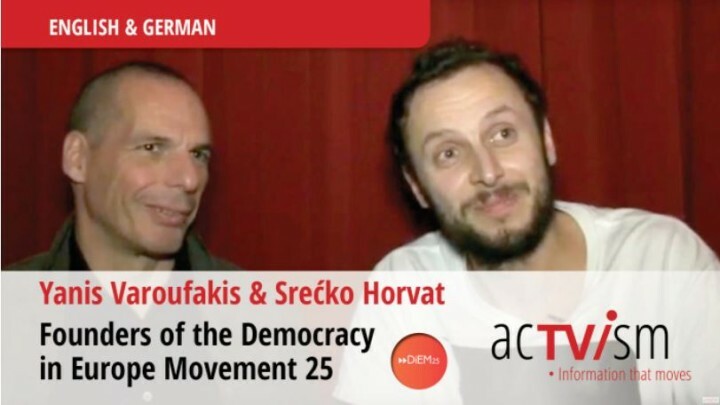 This interview was conducted on the 9th of February, 2016, in Berlin when the Democracy in Europe Movement 25 (DiEM25) was launched. What differentiates DiEM25 from grassroots movements of the past such as Occupy? What solutions and hopes does DiEM25 provide to ordinary people such as a single mothers or entire families living on a single pension? Will DiEM25 implement the following rule: “If politicians vote for something (like war) they should also be part of it”? These questions and many more are addressed in this video.